WHEN Billy Neale’s mum asked him what he wanted for his birthday, he decided he didn’t really want anything. So the teenager from Emersons Green asked his mum if he could spend the money she had put aside to help other people instead. Billy’s mum Helen gave him £100 and he went on a supermarket sweep to buy donations for his local foodbank. This is despite supermarkets being a challenging environment for Billy – he has nine conditions, including autism and Tourette’s syndrome. The 19-year-old went with his carer, Justine Guatieri, to Asda in Longwell Green, where they piled a shopping trolley high with essentials for people using the Resound Foodbank in Blackhorse Road, Mangotsfield. In total they bought 57kg of supplies, including enough food for 63 meals, toothpaste, shampoo, shower gel and nappies. Resound volunteers are hoping Billy’s example will inspire other people to donate. Former Blackhorse Primary School pupil Billy is currently at college in Weston-super-Mare, learning life skills and studying for a maths GCSE. Helen said: “The myth about autism is that people don’t have empathy but Billy is very kind – he always thinks of other people. Foodbank volunteers invited Billy, Helen and Justine round for coffee and cake to say thank you for his donation. The foodbank helps around six or seven families – about 15 people in total – during a typical week. But referrals increase around Christmas, with up to 18 families needing help each week. Families can be referred to the foodbank up to three times every six months. Donations can be made at the foodbank between 9.30am and 12.30pm every Friday (except December 29) and there is a permanent collection point at Sainsburys in Emersons Green. 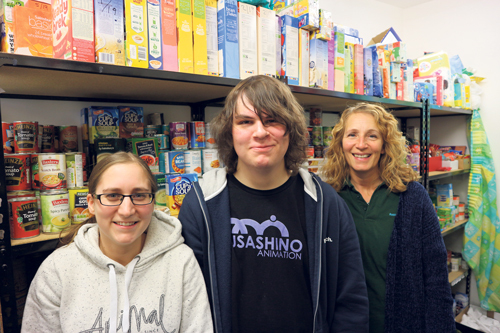 The Resound foodbank is a branch of the Yate and Chipping Sodbury Foodbank. For more information call 0117 305 0969 or email info@resoundbristol.co.uk.